Xtreme Coatings, Flite Technology, Inc.
A revolution in feed screw wear reistance technology!A revolution in wear resistance technology for the plastic and rubber industries!Excellellent for extrusion, compounding, injection and blow molding. Reduce Downtime by 50%! Reduce Rebuild Costs by 30%! Improve Production Efficiency! What is a feedscrew or barrel wear problem? A wear problem occurs when any feed screw or barrel, that due to any amount of wear, and without operating parameter modifications(1), will no longer deliver QUALITY(2), plasticized resin to the die or mold at the desired out-put rate, within the desired recovery/cycle time, or at the proper head pressure. Compensating for screw/barrel wear through machine parameter modifications can cause excessive shear, burning, and polymer degradation!Modifications are typically made to maintain out-put rates or decrease scrap ratesCosts of wear! Quality - Resin of quality may be defined as resin that is free of unmelt, was exposed to minimal shear, has seen standardresidence time, and is therefore free of degradation. Degradation - Loss of polymeric physical properties such as compression strength, tensile strength, impact strength, torsional strength, or other tangible or intangible engineered propertiesProduction Efficiency Advantage Factor! (PEAF) Defined as the quantified cost of inefficiency on a per machine, per month basis, and in most cases factors in as a reduction to feedscrew and barrel expense. NiBoride: Wear Resistance for ID Surfaces from .0005 to .005 ThicknessOur NiBoride coating is a proprietary composition of Nickel and Boron with a Knoop hardness of 1000-1100 HK (70-74 HRC). Post heat treatment produces a ense, crystalline structure of wear resistant Nickel Boride (Ni3B) with excellent abrasion resistance. The coating has a low coefficient of friction, high bond strength and can withstand high temperatures. Similar to the Electroless Nickel plating process, NiBoride can be deposited uniformly from .0005 up to .005 (12½ to 125 micron) thickness on virtually any metallic substrate. Complex shapes and inside diameters are candidates for our NiBoride coating. The as-plated surface finish is approximately 32 RMS (0,8 mm Ra). Polishing can meet almost any surface finish requirement including a mirror finish. This plating technology has value in any application where a small wear tolerance and adhesive or low stress abrasive wear shorten component life. Cushion Master: Long Life Non-return Valve for Severe Abrasive WearExtreme Coatings Cushion Master Series© check rings and seats are designed to compliment the wear resistance of a feed screw encapsulated with one of our coatings. Tip components are commonly replaced two to three times during the life of a feed screw. We have engineered these components to provide the necessary toughness, corrosion, and wear resistance to potentially reduce this ratio to 1:1, eliminating downtime and inefficiency caused by worn components. If replacing check rings and seats is a frequent burden then consider the Extreme Coatings Cushion Master© as your solution. Through-Put Calculator: How our Carbide Coating Can Pay For Itself in Weeks? As an extrusion screw wears, pumping efficiency decreases and output rate drops. 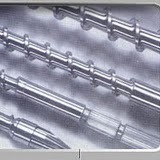 Feed screw speed is increased to compensate which increases screw wear rate and thermal input to the polymer. By not allowing the feed screw OD to wear as quickly, a carbide coating maintains pumping efficiency and higher output rate is achieved. Our through-put rate worksheet estimates this gain in productive output from a carbide coating. Basic inputs are hours of operation, new and worn output rate, estimated total OD wear, months to this wear point and the sell price of output. A straight-line wear curve is calculated for the present case and for our carbide coating using standard ASTM G-65 wear test comparative data. The difference between old and new production is compared and the difference multiplied by the product sell price. This dollar value is usually quite large and provides a very quick payback period on our carbide coating. Return on Investment: What Return Can You Expect for Your Investment in our Carbide Coating? The estimated Return on Investment (ROI) in an Extreme Coatings carbide coating is calculated using a few basic inputs. Present feed screw cost, feed screw substrate material, service life in months and an estimate of total OD wear are all that is required. With this information we calculate a new feed screw service life to the same wear dimension and compare purchase cost for a carbide coating with the present feed screw cost. This difference in cost is the investment for a carbide coating. The increased wear life multiplied by the previous feed screw monthly cost represents the gain from a carbide coating. ROI is the ratio of money gained or lost on an investment relative to the amount of money invested. In all cases, the gain from Extreme Coatings is far greater than the investment. In response to market demand, Extreme Coatings can apply our long lasting tungsten carbide to just the screw flight land. FliteGuard is an ideal option for applications where adhesive wear (outside diameter flight wear) shortens service life. Technological advances allow the root of the feed screw to be completely masked coating just the wearing portion of the feed screw, the flight land. FliteGuard is appropriate for new or rebuilt feed screws and the carbide can be applied either before or after a feed screw is chrome plated. The carbide coating thickness is limited to .005 (0,125 mm) per side or .010 (0.25 mm) overall. Extrusion productivity is especially sensitive to adhesive screw outside diameter wear. Doubling the screw to barrel clearance can reduce output and melt rates by as much as 25% in low viscosity resins. Contact Flite Technology or Xtreme Coatings to create a throughput estimate for your process. Tough economic times call for creative solutions. We are here to help you provide cost effective solutions to your customers. Our flagship product full encapsulation of any feedscrew with .005, .010 even .012 of hard wear resistant tungsten or chromium carbide. Virtually eliminates screw wear and provides a high level of corrosion resistance. We have coated thousands of screws like this. Metal to metal adhesive wear reduces the feedscrew OD. Protecting this surface with highly wear resistant tungsten carbide extends equipment life and can add a 10 to 15% boost to production output in extrusion processes. Selective coating on a high wear portion of any feedscrew also makes good economic sense. FliteGuard is ideal for applications where root wear is not a problem. This same FliteGuard option can make a worn screw new again. We can apply .010 per side or .020 overall (sometimes up to .030 overall) of tungsten carbide to the worn OD of a feedscrew. In these tight economic times you can offer your customer a solid solution that helps keep them processing. CPM-9V, D2, nitrided steel or virtually any screw material can be repaired using this method. Once a feedscrew is protected the weak link becomes the tip assembly. We offer this same tungsten carbide protection for non-return valves which provides 3 to 5 times longer service life in the most demanding applications. This service is available to improve the performance of new parts or to repair worn tip assembly parts and make them longer lasting. Most substrate materials can benefit from this process. We are developing the capability to apply our wear resistant materials to segmented elements with high bond strength to take the punishment. A metallurgical bond of our coatings to most substrate materials provides superior wear resistance for hard to replace elements. Help your customer alleviate the headache of changing out worn elements with this service. Emergency feed screw and barrel repairing, rebuilding, repairs. Rush jobs welcome for worn out and broken feed screws and barrels. Losing production, check your wear today.